I made this card using one of my new release digi stamps called 'Festive friends' available at the Stitchy Bear & I did it Creations Boutique - pop over there and take a look, once you download it you can use it as many times as you want this christmas on so many of your cards and scrapbook pages and anything else you can imagine up. 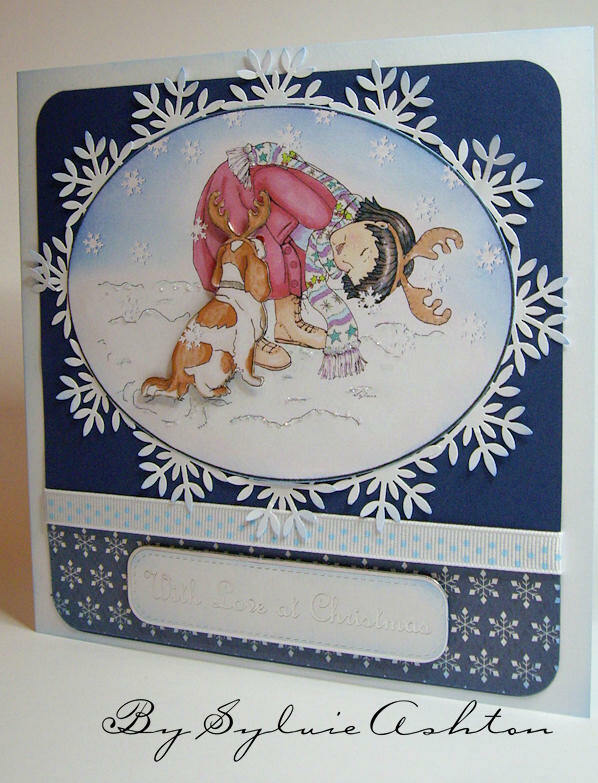 I used promarker pens to colour the stamp and added plenty of glitter on the snow. I enjoyed using a Martha Stewart snowflake punch to make the frame. I hope you like it and come back to see what other cards I make with it. Oh my goodness, Sylvie, she is adorable! I love it so very much, and I agree that Martha Stewart snowflake punch just makes the frame! 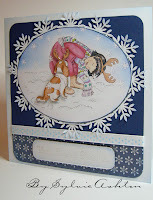 Beautiful card Sylvie, image is so very cute and your colors are gorgeous. I would like to thank you for all the free images you give they are all so awesome.